Home CDN , children , crafts , feature , February , holiday , holidays , homeschool , papercrafts , printables , US , worldwide February 23rd - Featuring Tootsie Roll Freebies! February 23rd - Featuring Tootsie Roll Freebies! 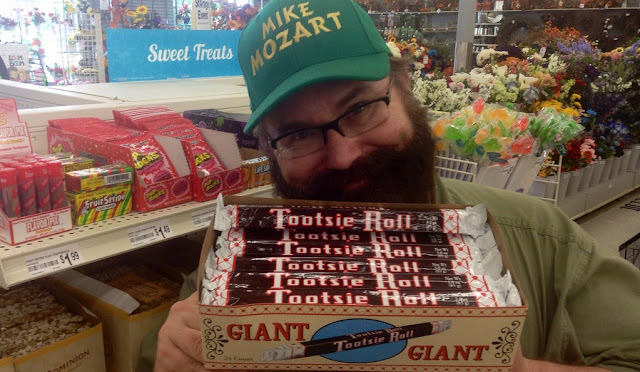 -- The Tootsie Roll story began in 1896, when Austrian-born Leo Hirshfield opened a tiny candy shop in New York City. Taking full advantage of his confectioner's background, Hirshfield personally blended, cooked, and peddled a variety of products, including an individually wrapped, oblong, chewy, chocolate candy which quickly became a customer favorite. Sold at a penny apiece and affectionately named after Hirshfield's five-year old daughter, Clara, whose nickname was Tootsie, Tootsie Rolls propelled Hirshfield's modest corner store into a burgeoning candy enterprise which has evolved in little more than a century into the multinational corporation, Tootsie Roll Industries. -- This official licensed Tootsie Roll candy coloring book is designed as an adult style coloring book with fine lines and details. Great for tweens, teens, children and adults of all ages! Filled with meticulously designed illustrations of all your favorite Tootsie Roll brands, including Tootsie Roll, Tootsie Roll Pops, Blow Pop, Fluffy Stuff, Sugar Daddy, Charleston Chew, Junior Mints and more! You'll find Mr. Owl, rainbows of candy, candy jars, dessert and so much more! Featuring 24 unique and creative designs, ranging in complexity from to simple to advanced, this coloring book will provide hours and hours of stress relief, mindful calm and fun, creative expression. • The Children's Hour Ad 1954 -- Family Circle April 1954. Original magazine page. NOTE: You are buying a magazine page, a piece of paper. Sheet size given is approximate. [8 1/2 x 11 inches]. • Tootsie Roll Midgees -- As the iconic treat which launched America's favorite candy company, Tootsie Roll, offers a perfectly-balanced cocoa taste, lined with a subtle, fruit-flavored undertone—all incorporated into a delicious treat. Buy in bulk to save money. Approximately 65 packs per pound. Item box size is 6" x 6" x 6" and contains approximately 4 lbs of candy. • How many licks does it take to get to the center of a lollipop? - A day for the dogs. And, that's because there is no one else who can really appreciate the true value of a dog biscuit. They say Every dog has his day. And, it will definitely be his day, when you give him some tasty dog biscuits. You might appreciate their value in pleasing your dog, as a reward for behavior, or enticing them to do a trick. But, the dog is the recipient of the treat. Celebrate today by giving your dog a few dog biscuits. - Banana bread first became a standard feature of American cookbooks with the popularization of baking soda and baking powder in the 1930s (and appears in Pillsbury's 1933 Balanced Recipes cookbook). The first banana bread recipe was thought to have been created by William Swanson. The home baking revival of the 1960s and the simplicity of its recipe led to an explosion in banana bread's popularity. The cookbooks of the 1960s added to its popularity because they commonly listed multiple variations of bread with added fruits and nuts. - Millions of Americans enjoy playing tennis. In addition to being a good sport, it is good exercise, too. If the weather in your area keeps you from playing tennis today, then watching or reading about tennis is a great backup activity. - A day to celebrate, learn, and to play a sport which began in Scotland in the 1500s. Curling is a team sport in which players slide heavy granite stones down a sheet of ice at a circular target area. A curling tournament is known as a bonspiel. Curling has been an official sport in the Winter Olympic Games since 1998, but curling was included in the the inaugural Winter Olympic Games in 1924, and the results were not made official until 2006. Celebrate this holiday by playing the game or learning about the history and scoring of the game. - In sociology, rationalization (or rationalisation) is the process where an increasing number of social actions become based on considerations of teleological efficiency or calculation rather than on motivations derived from morality, emotion, custom, or tradition. It is regarded as a central aspect of modernity, manifested especially in Western society; as a behaviour of the capitalist market; of rational administration in the state and bureaucracy; of the extension of modern science; and of the expansion of modern technology. - The Battle of Iwo Jima (February 19 – March 26, 1945) was a major battle in which the United States Marine Corps landed on and eventually captured the island of Iwo Jima from the Imperial Japanese Army (IJA) during World War II.